I have so many magazines that I am saving for recipes - it's a little absurd. Never mind all the cookbooks I never use. So I decided to clean out my magazine collection and cook my way through the recipes. 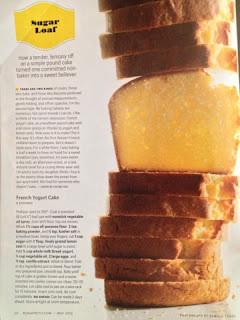 Starting with Bon Appetit, May 2012, I baked a yummy French Yogurt Cake last night. We served it with fresh berries and it was a hit. This recipe is a keeper. I'm even thinking I'll have some for breakfast today. Here is the recipe, I followed it exactly. Preheat oven to 350 degrees. Coat a standard loaf pan with nonstick vegetable oil spray. Dust with flour; tap out excess. Whisk 1 1/2 cups flour, 2 tsp. baking powder and 3/4 tsp. kosher salt in a medium bowl. Using your fingers, rub 1 cup sugar with 1 Tbsp. finely grated lemon zest in a large bowl until sugar is moist. Add 3/4 cup whole-milk Greek yogurt, 1/2 cup vegetable oil, 2 large eggs and 1/2 tsp. vanilla extract; whisk to blend. Fold in dry ingredients just to blend. Pour batter into prepared pan; smooth top. Bake until top of cake is golden brown and a tester inserted into center comes out clean, 50-55 minutes. 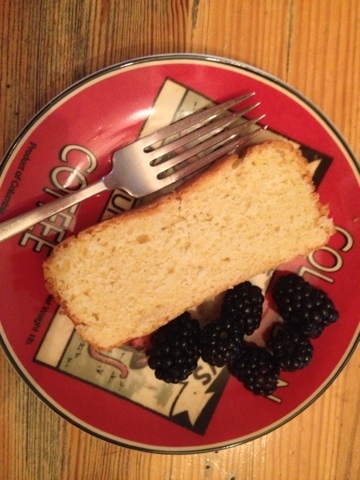 Let cake cool in pan on a wire rack for 15 minutes. Invert onto rack; let cool completely. Looks so good! I'm just starting a blog piece about cooking my way through a new cook book. All the while ignoring all the ones I have ignored. I should probably go back through like you did. Yah, I'm basically making a rule: No new Magazine subscriptions or cookbooks till I get thru a few of the ones I have. We'll see how long I last!